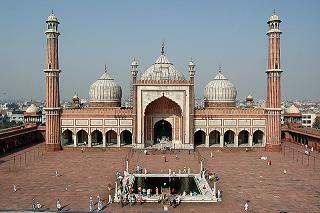 Jama Masjid is the largest mosque in India, and stands across the road from the Red Fort. This mosque is located in the centre of the old city on the top of a large hill. This mosque was built between 1644 and 1658 by the Mughal emperor Shah Jahan. The mosque stands on Bho Jhala, which is one of the old Mughal capital cities of Shahjahanbad. Jama Masjid is not only architecturally beautiful, but it is also a place of great religious significance as it house a hair from the beard of the Prophet, as well as a chapter of the Holy Quran written by him. This mosque was built by Sultan Ahmed Shah in 1423 and later by Shah Jahan. This mosque is built in yellow sandstone and combines the best of Hindu and Muslim styles of architecture. The work on this tomb was started in 1650 by Shah Jahan and was completed in six years. The mosque is the final architectural piece built by him. The mosque was built by more than 5000 artisans, with red sandstone and marble. This mosque stands on 260 pillars supporting 15 domes at varying elevations. The main courtyard of the mosque is about 408 square feet and is paved with red stone that can hold thousands of the people. In the centre, a large marble tank is located in which the devout wash before attending prayers. The main mosque is crowned by three onion-shaped domes made of white marble and inlaid with stripes of black slates. The courtyard is in the rectangular shape and about seventy-five by sixty-six metres. The central courtyard is accessible from the East, though there are three ways on the other side too. The Eastern side entrance leads to another enclosure which contains the tomb of Sultan Ahmed Shah. 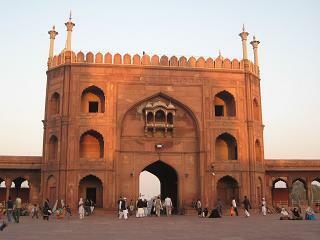 On the east, this monument faces the Red Fort and has three gateways, four towers and two minarets. On the north and south of the complex are the two 130 feet high minarets which offer a spectacular bird’s eye view of the city. The main eastern entrance remains closed on most of the days of the week and was perhaps used by the Emperors. Near the Eastern entrance stands the tomb of the Sultan Ahmed Shah, which was homage to the Sultan by his son Mohammed Shah II. The tomb houses the graves of three great rulers of Gujarat - Ahmed Shah I, his son, Mohammed Shah and his grandson, Qutub-Ud-Din Ahmed Shah II. After 100 years, a nobleman, Farhatul Maluk repaired the tomb, who also got the walls of the mosque engraved. Today after centuries of heat and rough weather, the Masjid stands unchallenged serving as a prayer place for numerous Muslims residing in the city.